Mangal Pandey is famous in Indian history as a freedom fighter who gave his life to free the country from the British raj. He played a key role in the revolt of 1857 also known a Sepoy mutiny of 1857. 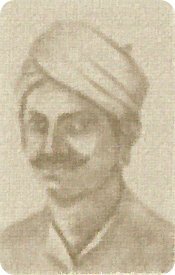 Mangal Pandey was born in a Hindu Brahmin family in Uttar Pradesh on 19 July 1827. He joined the east India company’s army as a Sepoy at an age 22. He was a soldier in the 6th Company of the 34th Bengal Native Infantry. He started the revolt in Barrackpore near Kolkata on March 29, 1857 by attacking his British sergeant. He was arrested by the other sepoys. He was hanged till death on April 8, 1857. He is also remembered as a first martyr of Indian freedom movement. He was a diligent follower of Hinduism. The reason behind the outburst of his anger was a cartridge of a riffle( Enfield P-53 rifle). There was a rumour that the cartridge was greased with fat of cow and pig (in Hindu religion the meat of cow is prohibited). A movie ‘The Rising’ (2005) was made on the events of mangal pandey’s life. His picture was also depicted in a postal stamp by Indian government.